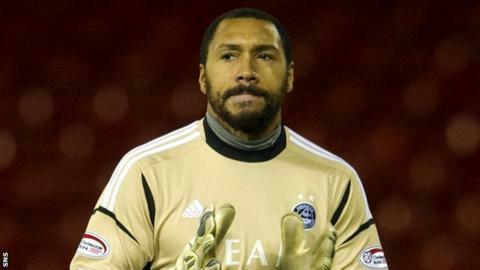 Goalkeeper Jason Brown has left Aberdeen with immediate effect. The Welsh international joined the Dons from Blackburn in 2011 and made 28 appearances for the club. "Jason made it clear to us he was keen to return to England and continue his career," said Aberdeen chief executive Duncan Fraser. "He is a proud member of the Welsh team and in order to maintain his place in the squad he feels it is vital for him to be playing every week." Brown began his senior career at Gillingham after coming through the Charlton youth system and moved to Blackburn in 2006 after making over 120 appearances for the Gills. Brown has won three international caps for Wales.